· (ALtitude RETENTION MODE) Due to the built-in air pressure sensor: Make sure the throttle stick is in the middle position, when the throttle stick is pushed and then released, the RC drone will automatically adjust the height. 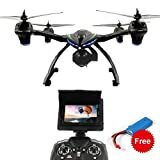 · (2.0MP HD FPV camera) Allows you to record higher quality video or take clearer images. Capture your friends and family from aerial shots and see the world from a new angle. Capture and record every beautiful and unforgettable moment. · (STABLE FLGHT SYSTEM) The drone will fly stably so that you can enjoy the easiest flight, taking clear photo and video. 3D roll function for you to experience the cool game of flight. With the latest 6-axis gyro flight control system, and Adopting 2.4Ghz control radio technology, ensure powerful anti-interference capability.